Oral Surgery means diagnosis and treatment of oral conditions of the teeth, jaw and oral structures which require surgical intervention. The specialty is also called as Oral and Maxillofacial surgery which tends to involve a larger area of the Oral cavity and Facial muscles, nerves and bones. It involves the diagnosis and surgical treatment of congenital or acquired diseases, dysfunction, defects or injuries of the mouth, jaws, face, neck and adjacent craniofacial region. 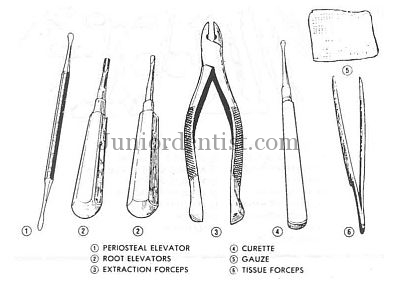 Instruments used in Oral and Maxillofacial Surgery, this is important for students in Dental schools who need to know the instruments required and helps them prepare for the OMFS departments. What are the Oral Surgical procedures which can be performed by a General Dentist? The General Dentist is authorized or capable o only performing limited number of Surgical procedures and most major surgical procedures are left for the Oral and Maxillofacial Surgeon. Here are some of the basic instruments that i have listed out, please comment if i have missed any so that i can include it in the post. These are some of the essential instruments used in Minor Oral Surgical procedures in a dental clinic by either a General Dentist or an Oral Surgeon. Instruments in Oral Surgery are described as Name, Make or Instrument, Parts and Indications of the Instrument which we have explained in detail in the other posts – Maxillary Instruments and Mandibular Instruments.